It's 5 o'clock and Mommy needs her sippy cup! I just fell in love with the whimsical designs from Misty and Sandy's. 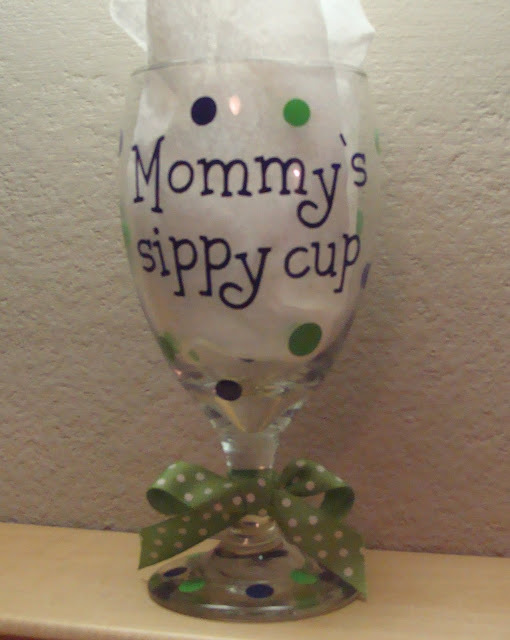 This super cute boutique glass is ideal for Mommy's wine or margaritas... depending on the mood! Standard wine glasses are also available. Select your three favorite colors, and the glass is custom designed just for you! A matching ribbon is added for the final touch. Discounts are offered on orders of 2 or more themed wine glasses. Fun gift for Mother's Day or Mommy-to-Be. Please order before May 5th to ensure delivery by Mother's Day. One lucky Embraced Chaos reader will win a Mommy's Sippy Cup in your choice of colors. Please visit Misty and Sandy's, pick out your favorite item and leave a comment at the bottom of this post. Click Top Mommy Blogs button at top left and click vote. Leave a comment. Become a Facebook Fan of Embraced Chaos. Leave a comment. Become a Google Fan of Embraced Chaos. Leave a comment. Add the Embraced Chaos button on your blog. Leave a comment. Blog about this giveaway and include a link. Leave a comment. Please include your e-mail address in each comment for winner notification. Deadline for entry is Friday, May 7, 2010 at midnight. Winner is selected via Random Org. Please respond to winning e-mail with mailing address within 48 hours to claim prize. Shipping only in US, and please no PO Boxes. Cheers to a Happy Mother's Day! This giveaway is now closed. Congratulations to our winner! That's so cute - every mother should have one! I want that moms sippy cup! Hehehe! Love this "sippy cup". Following your blog & on Facebook! Are you on Twitter? I love the I'll wine if I want to 20oz glass! I love the girls night wine glass. I like the Bama Girl wine glass. I like the Fleur de lis Soap Dispenser. I clicked and clicked and voted for you. I love the 'green' customized aluminum bottles, what a great gift for the sports fan! My favorite item is the Girls night out 20oz Wine glass. I like the ice cream die cuts. I like the Teacher treat jar. This is the time of year when the kids give gifts to their teachers, so this would be a cute gift. I love the cake carrier. Very cute and great for tailgating. My favorite is Girls night out 20oz Wine glass. I love the monogrammed wine glasses. I love the Fleur de Lis Soap dispenser!